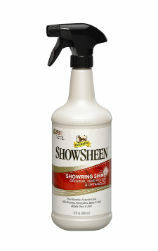 Uniquely formulated to provide a healthy shine and make grooming easier, ShowSheen® Hair Polish & Detangler is not only an excellent horse hair detangler for snarled manes and tails, it’s also incredibly versatile. Apply it over your horse’s coat to repel dust and keep him clean longer. Want to easily remove burrs and debris? Spray the affected area, allow it to absorb, and burrs will slide right out. And you can apply before turnout to prevent mud from sticking. Proven to reduce hair breakage by 40%* for fuller, longer tails. Helps cut grooming time in half. Contains provitamins to nourish coats and silk proteins to strengthen manes and tails promoting stronger, longer hair. Features light, mild scent of calming jasmine and soothing sandalwood. Repels dirt and dust to help horses stay cleaner longer while also helping reduce static.